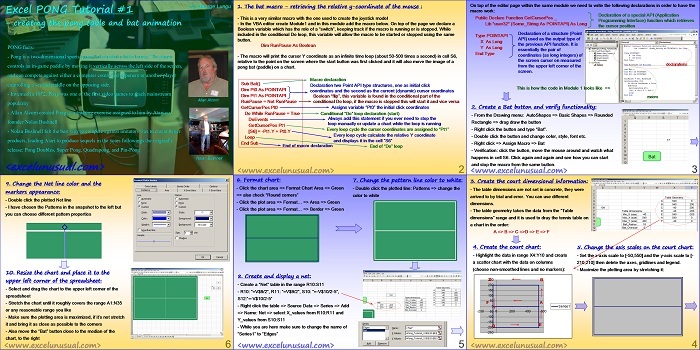 This post contains the first part of a series of tutorials demonstrating how to build a lively game of Pong in Excel. The section deals with the bat movement VBA macro, and plotting the “court” or “tennis-table” on a 2D scatter chart. Great stuff. I am a newby at programming and am overwhelmed by what you have accomplished here on your website. I am working on an air traffic control simulator for instructional purposes at work and am hoping to be able to adapt some of your coding techniques to my project. Thank you for making these available to me.